Putin's flight with the cranes, dubbed the “Flight of Hope,” was broadly ridiculed on the Internet and by international media as a publicity stunt. Despite President Vladimir Putin's best efforts, five Siberian white cranes raised in captivity did not migrate south as scientists had hoped, and the one that did make the trip was attacked by wild dogs after separating from its adopted flock. 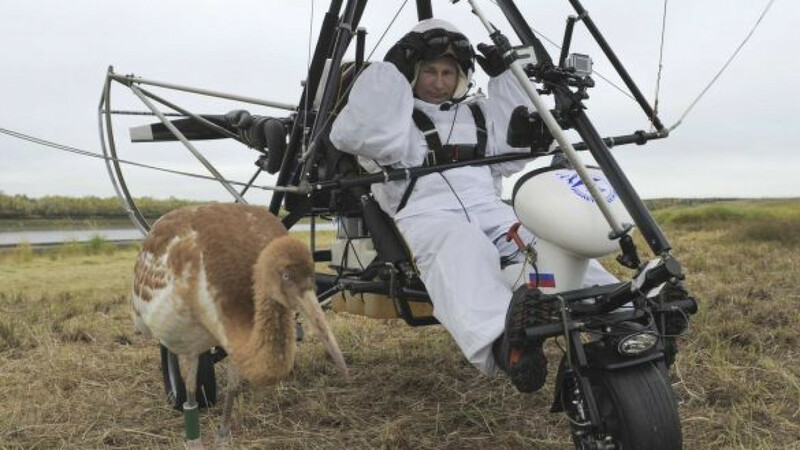 Putin's hang gliding stunt with the cranes in September, dubbed the "Flight of Hope," was hailed by supporters as a genuine effort to attract attention to the species' fate but ridiculed by opponents as a publicity stunt. The flight also caused a scandal when some biologists said several cranes had died as a result of the event, while Masha Gessen, then editor of the magazine Vokrug Sveta, said she had been fired for refusing to cover it. In September, Putin took part in a project in which pilots guided the cranes in the Yamal-Nenets autonomous district and tried to teach them to migrate on their own. Ornithologists accompanied the white cranes from the district to a nature reserve in the Tyumen region. But when a flock of common cranes — a different species — left the Tyumen reserve for Central Asia after the first snowfall fell recently, all but one of the white cranes remained grounded. A representative of the Federal Inspection Service for Natural Resources Use told Interfax on Wednesday that the five cranes had likely not adapted to their new surroundings. "Yesterday, the [five] young cranes and ornithologists flew back by plane to the Ryazan region, to the Oksky sanctuary. They'll spend the winter there," the representative said. It was later reported that one of the sanctuary-reared cranes did take off with its wild brothers but that it separated from the flock 500 kilometers into the journey over Kazakhstan. A pack of wild dogs then attacked the inexperienced youngster, which was saved only when locals shooed away the dogs and gave it shelter, Interfax reported. Responding to the news Wednesday afternoon, Dmitry Peskov, Putin's official spokesman, described the news as "sad" and said that the head of Kazakhstan's forestry commission had agreed to personally take care of the lost crane. Peskov added that the crane would later be flown back to its Ryazan region home and that Putin had assured him that the government-backed program to protect the endangered Siberian white crane would be extended.